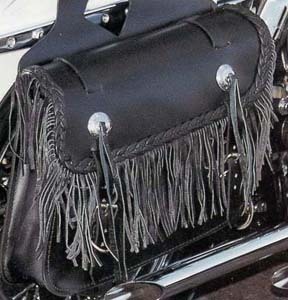 Large sized saddlebag has braided leather trimming fringed flaps. Silver toned conchos match many of the other items in this series, but are easily replaced with your favorite styles. Cut outs in throwover center. LOOKING GOOD! Sizes:15" x 12" x 4"